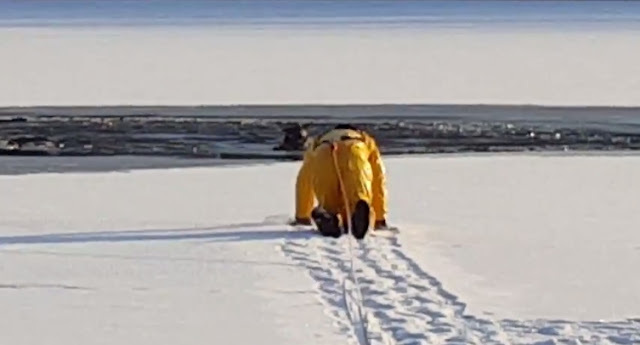 Video shows a dramatic rescue as firefighters in Passaic County, New Jersey, pulled a puppy to safety after it fell through the ice on a lake Friday morning. The call came in for help just after 8 a.m. The 6-month-old German Shepherd fell through the thin ice formed on top of Lindy's Lake in West Milford. The West Milford Fire Department sprang into action, and rescuers worked through way out to the dog, which was about 75 yards from the shore. When Deputy Chief Darren Williams and Captain Jeff Boltzer first reached the pup, it was scared and attacked the rescuers. The firefighters didn't give up, though. They kept trying and finally helped the dog out of the water. The puppy, shivering, wandered around the ice for a few minutes before jumping to land, where it was reunited with its owner. Responses to "West Milford firefighters rescue a six-month-old German shepherd from icy lake"
Copyright © 2011 White Wolf .